Growing up in Raleigh, Cameron Village was a destination for my family. I can vividly remember my Aunt traveling down from Winston Salem just to make a special trip to shop. It’s been so fun to watch the shopping center evolve over the last few years as an adult living in my hometown. Even more amazing is realizing how many awesome vendors are there that benefit my interior design business! One of my favorite sources, and in my opinion the BEST place in Raleigh to find unique global pieces is Nadeau. Check out my video below to get a peek inside. What I love the most about the Nadeau experience is you literally have to wander around the entire store. The way the team sets up the store is sort of like a furniture maze! You enter at one spot near the front of the store, and in order to get back out, you have to either turn around or keep going until the end. Being forced to slow down and explore the beautiful variety of furniture just gets my creativity going! Daniel’s tip for shoppers: Every shipment is different with many are one-of-a-kind pieces. There is no ordering, so when you find the perfect piece you should consider purchasing ASAP or it will be gone! I fell in love with the shellback green velvet chair during my last visit to the store. Someone please go buy it because I have no space left in my studio! They also carry an amazing collection of unique accessories from around the world! One of my favorite styling tips are to use woven baskets like the ones I’m holding here. 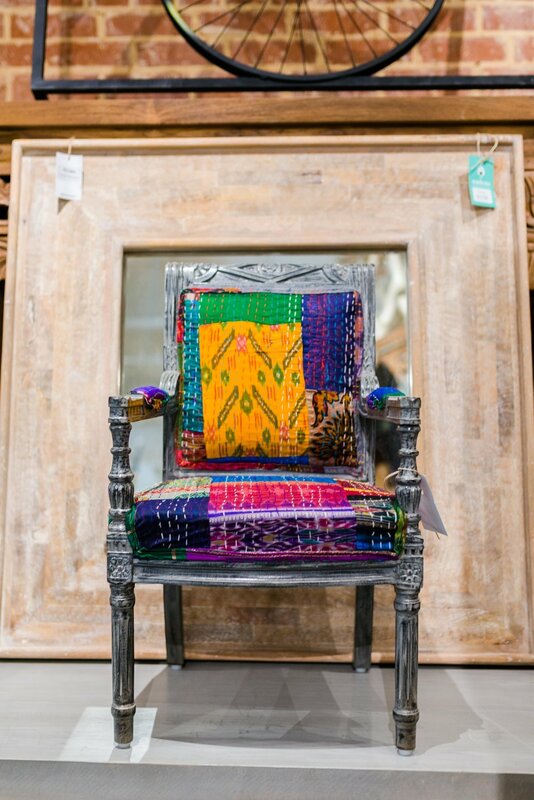 There are great gift ideas for friends and family you want to purchase a one of a kind piece for, like this beautiful upholstered mini chair. How cute would that be in a nursery? 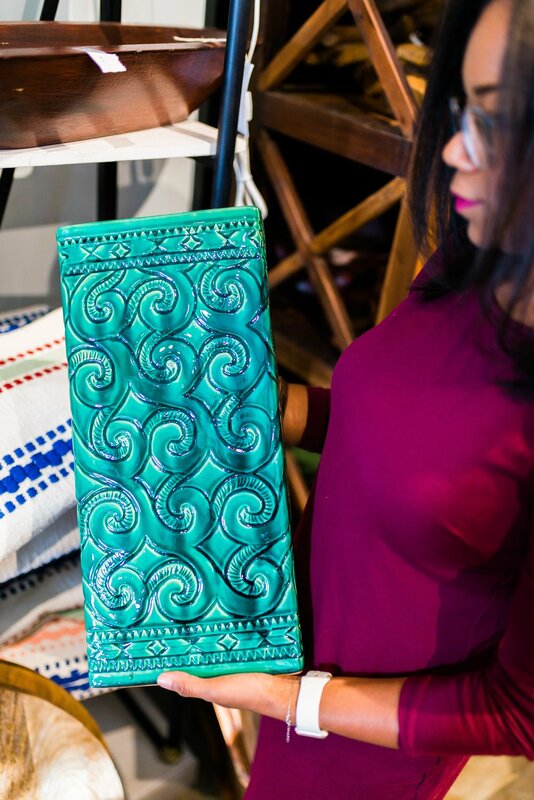 Be sure to follow @NadeauRaleigh on Instagram to keep up with the latest in their inventory and stop by the store in Cameron Village at 426 Woodburn Rd. Thank you! You will receive an email every time a new blog post is live! Get 20% off your $200+ order from our shop with the code TURNKEY.